Every year people from all over the world migrate to Palm Springs, California, for one of the world’s most popular music festivals, Coachella. Whether you’ve been before, you want to go or you’re just happy cruising the festival circuit in Australia, there’s no denying we’ve all been eyeing off this year’s hottest trends at ‘Chella Weekend One. Who’s wearing what? Are face jewels still a thing? Whatever you’re looking for, it’s always great to get some inspo for upcoming festivals back home like Splendour in the Grass and Falls Festival. Especially when it comes to makeup. Makeup at any festival is tricky. Have you cleansed your skin properly? Do you have a mirror? Have you forgotten anything? How much is too much? How can I make it last all day? But it’s also the perfect opportunity to really explore with colour and glitter as well as splashing out with a bold statement. And above all, it’s a time to get creative and have fun. Put away your neutral colour palette, just on this occasion. Book in with a makeup artist (if possible). This is going to save you loads of time, years of glitter stuck in your carpet and it ensures your makeup is flawless all-night long so you can focus on having the time of your life. If that’s not an option, I’ve got some handy pointers on how to create an awesome look, make it last all day/night and the best way to remove it. Of course, there are so many looks to choose from which can be super. I suggest first find 1-2 inspo images and let that guide you (or your makeup artist) in terms of colours, glitter and jewel placement, style etc. Personally, I love focusing on the eyes for festival makeup. Winged eyeliner is always a winner if you’ve mastered the skill or you have a makeup artist on hand. I think it looks really effective and blends in brilliantly when using glitter on the face. Keep a more of a natural lip if you’re going to go all out on the eyes. You don’t really want to worry about fixing smudges or lipstick on the teeth mid-gig. The key to ensure your makeup lasts is to spend time preparing your face with moisturiser, primer, long-wearing foundation and a finishing spray. You want to know your makeup is set in place through all the dancing. These products are all designed for long-wearing and will provide the full coverage you want. A flawless base is also going to make things like glitter glide on like a dream! First things first, apply a light layer of foundation all over before applying your eye makeup and glitter/jewels to the face. Adding false lashes on top will pull your entire look together but I’d say opt for a natural looking lash (and make sure there’s enough glue on the outer and inner corners). After completing your eye makeup, if you have any fall out (excess product) under the eye, clean it up with a makeup wipe before applying the second layer of your foundation. Add more concealer than normal to the centre of your face, as this is generally the first place you will notice your makeup come off. Then finish off with your favourite bronzer and touch of blush! Lightly dust a translucent powder over the whole face to lock everything in place and for good measure, add a couple pumps of your fave makeup setting spray. Above all experiment let your imagination work the brushes as well, you never know what magic will happen. Drop glitter on the carpet… or anywhere for that matter – trust me on this one! There is no right or wrong way, it really just depends on how much glitter you are putting on in a desired area. A popular area to apply glitter is where you would use highlighter (on the highpoints of your cheekbone). Using a triangle makeup sponge, apply a 1-2 drops of colourless eyelash glue followed by placing the glitter on top of the glue. If you are wanting to apply glitter under your eyes, I would recommend using the back of your eyeshadow brush. Now the fun part is over. This is the part I dread. The best way to take off the glitter is with an oily based remover, I like to use the Cleanse Off Oil from M.A.C. This is super easy and pain-free. The only pain is how long it takes. Don’t let this deter you from using glitter though! I would recommend taking off your eye makeup first especially if you are using glitter underneath. Use a cotton tip to remove glitter and cotton pad to remove the remainder of the product. I hope this blog encourages you to get out of your comfort zone and to have a great deal of fun. If you are lucky to be enjoying yourself at Coachcella Weekend Two, I am thinking of you all. Can’t wait to see the amazing looks you create. Tag #cmcmakeup in your pics for a chance to be featured on my social pages. We all encounter challenges in life, this is inevitable. But the actions and choices you make on a daily basis can make a big difference to change the way you feel about yourself as well as changing the direction of your life. Some might say it’s only makeup, but like anything in life, it depends on your outlook and what you make of it. I can tell you that makeup has been my savior. It constantly gets me through tough times - it’s my passion, my creative outlet and most of all I can escape into a world full of beauty. The most important thing to remember is to have fun, I sometimes forget this. Then I have a light bulb moment, how can you not have fun and be inspired by makeup? Lastly, I used Studio Chromographic Pencil in NC15/NW20 in the inner-rim of the eye (this brightens, as well as making your eyes look bigger). This is one of my favorite lip combinations because it works with so many different looks. Inspiration can come in many different forms. I believe it’s important to constantly be inspired on a daily basis. This doesn’t have to be specifically related to makeup, I just think it’s an important way to grow and push yourself. I am always looking for inspiration. Whether it’s flicking through magazines or scrolling through my news feed. You can also be inspired whilst roaming the streets and observing people. For this look I wanted to emphasise my eyes as well as adding colour to my lips. Generally people feel more comfortable to focus on either their eyes or lips but you can choose both features. To set the makeup I use Mineralize Skin Finish in Light. For this look I used it under the eyes to set the concealer and corrector as well as on the nose & forehead. If you have oily skin or are wanting a matte finish I would recommend using powder all over the face, as opposed to certain areas. This will ensure the makeup will stay on for a long period of time. *Optional: if you want the inner corner to be more intense add a pigment – Vanilla Pigment from MAC is a favorite of mine. To be a little different, I used Fluidline in Shade in the inner corner instead of going with black. I used Berry Pink from the Anastasia Beverley Hills Lip Palette. This lip palette is amazing! Do you ever have days when you don’t know how you’re going to wear your makeup? These days, there are an array of different products - as well as choosing which look will make you look and feel your best. We have all been in situations at one point or another where we have had many events in one day which then roll into the evening. Then there is the other dilemma of not knowing what outfit will work for all events. I encountered this the other day and needed a makeup look that wasn’t too much for the day but one that would be elegant for night as well as go with any outfit in my wardrobe. I have mixed two foundations for this look. These two foundations from MAC are a great mixing combination. I know it is ideal to use one foundation but when something works why not. I was wanting a full coverage and long wearing finish with a natural glow. The eye shadow palette that I used for this look was by Morphe, 35O - 35 Colour Nature Glow Eye Shadow Palette. In the inner corner add the light gold (shimmer), if you want to intensify the colour add Fix Plus Spray to your brush. I can’t live without these products! For this beauty look I wanted a classic look, winged eyeliner with a red lip that can make a statement. It’s fascinating how this type of look can provide you with an instant pick me up as well as giving you the confidence to take on the day. Moisture SPF+15 Foundation (MAC) - I must say this foundation is one of my favourite foundations as I like a medium to buildable coverage that provides radiance. Prep + Prime Highlighter in Radiant Rose (MAC) - this is great for proving lightness under the eyes as well as the nose. Then to complete the base add Iconic London illuminator in Shine on the high points of the cheek. This week I have been waiting to try the eye shadow palette from Morphe and wanted to incorporate this beautiful palette with look number 2.I don’t know about you but when it comes to makeup it’s the small things that can create excitement, like new products to add to your makeup collection or makeup kit.You should try it, buy a product that you have wanted for a while and feel the enthusiasm to explore new products and techniques. For beauty look number 2, I have focused on the eyes by applying warm brown shades with colour. This is fantastic if you are someone who loves to use only neutral colours, try adding a shade of colour with shimmer. This is a great look, especially if you are wanting to get out of your comfort zone. When I incorporate colour on the eye, I really want to have a flawless, full coverage foundation, to conceal any unwanted blemishes and pigmentation. Finish with Mineralize Skinfinish in Soft and Gentle for a luminous finish. Who doesn’t love a coloured Smokey Eye to change your mood? Lastly add lashes (Kara S4). Brow Wiz in medium brown. I thought it would be a great idea to start a blog and to share with you my knowledge, recent looks and talk about products that I love. The look above is a look that is versatile and can be worn for a day or night look. If you want to transform this look you could substitute a bright or dark colour lipstick to make it more dramatic. That is the beauty of makeup, you can wear it to suit your mood. 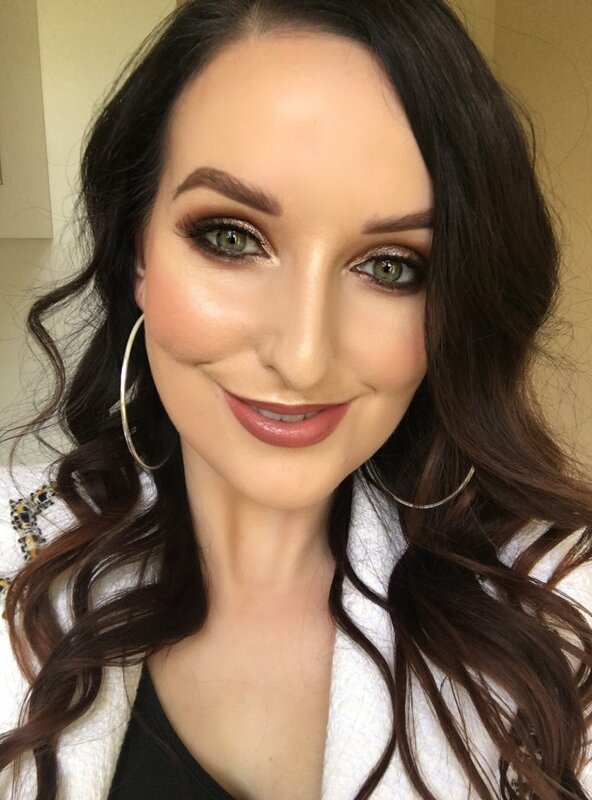 I am going to include all of the products that I have used for this look just in case you want to get your hands on these fabulous products or, alternatively, book me as your makeup artist. The first step to a great makeup application is a strong emphasis on the skin, spend time on making sure you have prepared your wonderful face. It will be worth it and above all your makeup will last. 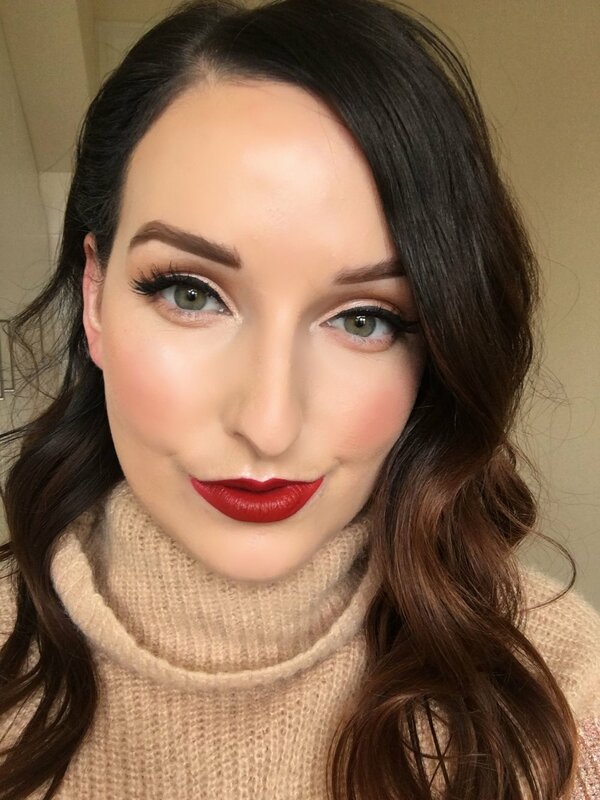 For this look I wanted a long wearing, full coverage along with a healthy glow. Add Champagne Pop (Becca) onto of Hush to really create that beautiful glow. This can be a determining factor, by focusing on your brows you can change the shape of your face.